10% Extra charge for chest size above 42 inches. Ask somebody's help to get your head measured for a more accurate sizing. Use a cloth tape measure to get the most accurate measurement of your head. Getting measurements at the right place on your head is very important. The ideal spot is at the centre of your forehead, covering the top slope of the bulge in the back of your head. Place the measuring tape snugly around your head at the spot mentioned in the previous step, not too loose, and even not too tight. Make a note of the exact measurement. Measure a few more times. 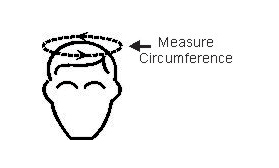 If your head measurement is between the size ranges, choose the larger size. Measurement of shoe size: Please follow the instructions below. To measure your exact shoe size will need a pen, paper and scale. Trace your feet on the paper and mark its boundries. Make sure your foot in firm and straight. Make sure that the pen or pencil you use is straight. This is very important. Now measure the length of your foot from toe to ball and compare it to our standard shoe size chart given below. If you have a different shoe in a european or US size, you can see the chart below to know its corresponding indian size.